Innovations within safety management systems showcase scalable approaches to addressing aviation risks. Best practices within safety management systems (SMS), as implemented for international commercial air transport by the aviation industry and governments, often share a common characteristic, subject matter experts say. Analyzing high volumes of safety data from flight operations and identifying risks are only part of the equation. The information derived from the process also must become integral intelligence in order for an SMS to create, implement and validate the effectiveness of risk mitigations, the experts told the FSF 68th annual International Air Safety Summit (IASS). Several presenters at IASS, held in November in Miami Beach, Florida, U.S., emphasized that a growing number of industry/government organizations have turned initially far-reaching, high-level aspirations for SMS — as introduced in Canada about 10 years ago — into everyday capabilities that make a measurable difference, and that the trend is continuing. As an example of operator SMS performance issues, she recounted a 2011 Boeing 737 NG takeoff incident,1 in which the flight crew’s effective response to erroneous air data indications resulted in no damage or injuries but they downplayed the potential risk of loss of control–in flight. Investigation by TSB — which became aware of the event only because the flight crew had reported the overweight landing as required — found inadequate consideration by the operator’s SMS. The airplane manufacturer’s prior advice to operators of the aircraft type had been disregarded by this operator, and the operator deemed the event too insignificant to be reportable to TSB or to be fully investigated internally. She counts among key factors indicating a strong SMS and safety culture: congruence between tasks and resources, effective and free-flowing communication, clear grasp of what is at stake, and keeping a learning orientation. She added that a robust SMS is “exactly about putting in place a formal process to recognize hazards, to analyze them and to implement mitigating measures to reduce the risk that they hold … not just from the top down but also from the bottom up. He said that a “pragmatic” director of safety at the time expressed doubts that FAA principal operations inspectors could be reoriented after decades of using safety data to hand down enforcement packages against airlines. “That resonated with me,” Allen said, recalling thought processes that ultimately led current FAA Administrator Michael Huerta to announce a compliance philosophy (FAA Order 8000.373) and to issue an updated compliance and enforcement guide for all FAA inspectors (ASW, 11/15). FAA inspectors had needed clarity about their options to use such alternative responses to correct unintentional deviations or noncompliance caused by factors such as flaws in systems and procedures, simple mistakes, lack of understanding or diminished skills. “That is going to help [airlines] tremendously in the future for SMS. That is going to move our sophistication [to] the new era of safety [going] forward,” Allen said. 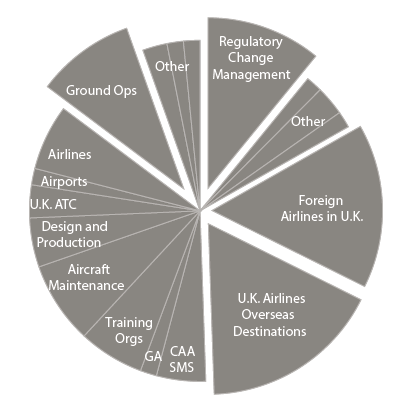 The SMS of the U.K. CAA has some characteristics and documents comparable with those of other states, as well as a unique general safety model that has applied bowtie analysis (Figure 1; ASW, 6/13) to generate its Significant Seven risk-reduction priorities, and the Safety Wheel (Figure 2), plus about 14 bowtie analyses of other important issues. 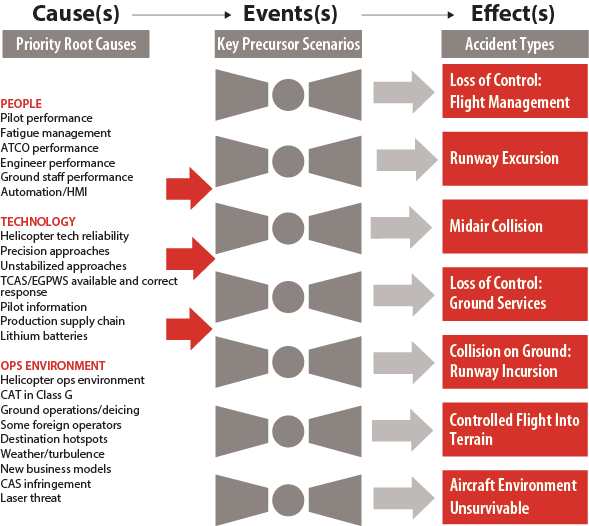 Notes: The U.K. Civil Aviation Authority SMS has conducted bowtie analyses of flight operations risk factors, assessing priority root causes in key precursor scenarios to choose its Significant Seven national safety priorities. “The Safety Wheel came about because we talked about developing the SSP … and we decided that what it should do is to protect U.K. citizens from flight safety risks. … When we put the U.K. citizen in the center of our thinking — and put around them [the question] ‘Where does risk exposure to that individual come from?’ — what we discovered is that a lot of it comes from sources where we have no oversight,” Courteney said. “In some cases, we have no influence or even any relationship. … [This insight] did get us thinking that perhaps where we see hotspots — events in particular locations or groups of events for particular airlines coming into our airspace — we should be a bit more proactive in addressing that.” The first effort was to meet, propose a safety partnership and collaborate with U.K. CAA counterparts from Turkey. Notes: A strategic planning exercise of the U.K. CAA SMS was to visualize a citizen–air traveler at the center of risk factors, then prioritize relevant risk mitigations. “We all walked away from that with a lot of new insights and quite a lot of actions. In three months, [safety] events were down 85 percent. By the end of a year, they were zero. … The benefit is we understand each other better, and we actually know each other so when things start to happen, we can pick up the phone and sort it out. Since then, we’ve started to work with some other states, and we’ve had some other projects,” she said.The Significant Seven emerged from the SMS as a way to get the maximum safety benefit by identifying leading fatal accident types, and the two or three main scenarios that end in those crashes. “We did bowtie analyses on those scenarios … and they really guided us to where our safety initiatives should be,” Courteney said. Ten years ago, there were no ICAO requirements for states to implement an SMS or an equivalent concept, added co-presenter Amer Younossi, deputy division manager, FAA Safety Management and Research Planning Division. The current SSP contains regulations specifying the SMS requirements for the companies operating under Federal Aviation Regulations Part 121, Air Carrier Certification; for the FAA Air Traffic Organization; and refers to the SMS rulemaking under way for aircraft design and manufacturing organizations and airports. Voluntary adoption of SMS by other industry sectors is expected. “That’s the area that we’re not fully compliant with [ICAO standards],” Younossi said. A related FAA strategic initiative calls for risk-based decision making “to ensure that we are moving to a safety management construct,” he said. By harnessing efficiencies gained in SMS data automation and merging cross-functionality trends into a centralized safety database, airline safety departments can better analyze what is happening over time and strategically target their mitigations, said Christopher SanGiovanni, director ground safety, JetBlue Airways. 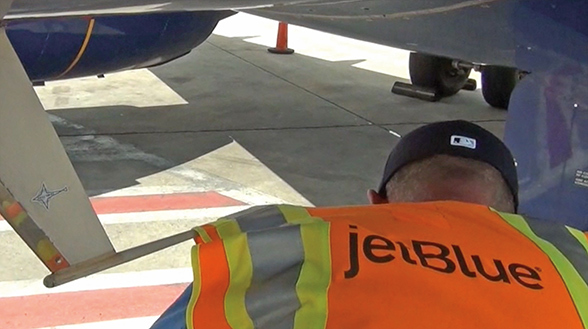 The SMS at JetBlue Airways enables real-time monitoring of reports on ground operations injuries and aircraft damage caused by ramp personnel striking antennas, pitot tubes and other protruding parts. With the HFACS framework of causal factors, the SMS can compare one accident with another or even compare events that seem impossibly dissimilar, such as comparing cases of pilots entering the wrong information into the flight management system and ramp personnel incorrectly loading cargo. “With HFACS, these two events can be compared not only by the psychological origins of the unsafe act, but also by the latent conditions within the organization that allowed these acts to happen. … Common trends within an organization can be identified,” he said. JetBlue has optimized use of descriptors within the framework, creating a still finer classification called nano codes. “With hundreds of nano codes now identified … we are able to trend across the different safety and quality programs in a very JetBlue-specific way,” SanGiovanni said. “This analysis and categorization feeds our SMS management structure. Systemic risk that develops a notable trend is identified through investigation, evaluations [or] even our [voluntary] safety-concern reporting. TSB. “Erroneous Air Data Indications, Sunwing Airlines Inc., Boeing 737-8Q8, C-FTAH, Toronto–Lester B. Pearson International Airport, Toronto, Ontario [Canada], 13 March 2011.” Aviation Investigation Report Number A11O0031. The report said that discrepancies between the Sunwing SMS manual and company practices at the time of the event included a hazard analysis procedure not practiced, an investigation procedure that did not detail how to conduct investigations, and lack of training on safety-event follow-up responsibilities of safety coordinators. Transport Canada subsequently accepted the airline’s corrective action plan, TSB said. ICAO. Annex 19, Safety Management. First Edition, Nov. 14, 2013. Annex 19 is supported by Doc 9859, Safety Management Manual, Third Edition, May 3, 2013. 72nd annual International Air Safety Summit scheduled for Nov. 4–6, 2019 in Taipei. Deadline for submitting nominations is Aug. 21, 2017.